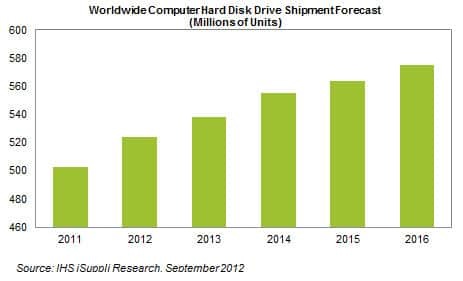 A year after the Thailand flooding disaster partially derailed production, the global hard disk drive (HDD) industry has fully recovered, with shipments to the computer market expected to hit a record level this year, driven by the enterprise market as well as the arrival of the Windows 8 operating system. HDD shipments in 2012 for the overall computer market, including PCs, are forecast to reach 524.0 million units, up 4.3 percent from 502.5 million units last year, according to an IHS iSuppli Storage Space Market Brief from information and analytics provider IHS (NYSE: IHS). The 2012 number will be the highest shipment figure on record in the HDD books at year-end—but the achievement will not stand for long. In fact, HDD shipments are projected to climb continually, the stellar results of each year bested by the next in predictable but welcome fashion until at least 2016. By then, HDD shipments will hit 575.1 million units, as shown in the figure below. The forecast includes HDD shipments only to the PC compute segment, which includes client HDDs for desktops and notebooks on the one hand, and enterprise HDDs for servers and storage systems on the other. The forecast does not include HDD shipments for other applications such as in automotive, external hard drives or DVR devices. In contrast to the glowing performance of HDDs for the PC space, annual HDD consumer-related shipments will decline this year from 2011 levels. Another major growth driver for the HDD industry will be the new Windows 8 operating system to be launched in October. The market also will be boosted by ultrabooks, including those using hybrid HDD/SDD storage solutions, which will see an increase in shipments in the fourth quarter, although volumes will be relatively low this year. Both factors are believed to be the best hope by the beleaguered PC sector to take on smartphones and tablets such as the iPad from Apple Inc.—two devices that have gobbled up the once-flourishing market of mobile computers like notebooks and netbooks. Through the revival of the PC sector, the HDD space—especially the enterprise HDD market—also stands to reap benefits by supplying the storage media for computers. Such encouraging developments overall will help deliver a growth year while compensating for a weak third quarter, blamed by HDD players on persistent economic problems around the globe and the erosion of the PC market by smartphones and tablets.